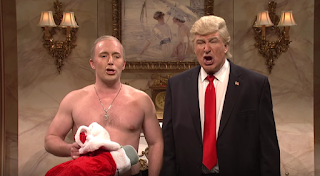 Trump and Putin as portrayed on SNL last December. It's been six months since that pathetic and immature man was elected to the presidency. An NPR new story yesterday morning discussed how his supporters think the only outrage is when people criticize him. But where do you even start in evaluating where we are? Strangeness regarding Russia remains. I think Trump could just have a man-crush on Putin, but at the levels he's playing, it's not that simple. The firing of Comey last week, a man who I think deserved to be fired, yet the firing indeed raises troubling questions about the man who is president. He and his administration immediately came up with the most ridiculous lies about it. They fired him because of his handling of Hillary's email case? Yes, that was worth firing him over, but come on? How stupid do they think we are? Stirring things up with North Korea. Best outcome, a house of cards will fall and the world will work to assimilate the poor people of North Korea into modern times. Somehow such a rosy outcome seems highly improbable. Worst outcome? A nuclear attack. The monster in the White House is playing with fire and he seems so clueless. Sharing classified information with Russia--information provided by Israel (per the latest reports). Trump's racism, so prominent in helping rally whites in this country to support him over Hillary. Sesssions as attorney general is the most horrifying manifestation of the racism of trumpism. And Sessions can hurt plenty of Americans. How dare the Senate rubber stamp that man. The attacks on the media and separation of church and state are running unchecked. The economy is humming along, for now. Health care is under reckless threat. Yes, American healthcare is a disaster, yet no Republican in power has offered a sane step in the right direction. All they offer is taking away healthcare and hopes of cutting taxes for the wealthiest which will only increase inequality even more. The promotion of coal is just bizarre. The threats to federal lands and environmental laws and regulations feels nearly unlimited. The Senate Republicans got Gorsuch instead of Garland. That is bad for all but the wealthiest reactionaries among us. I donate monthly to the Democratic party and have made some calls to Washington. It doesn't feel like enough, but I'll keep doing more. We all must do more. Write, call, march, give money. 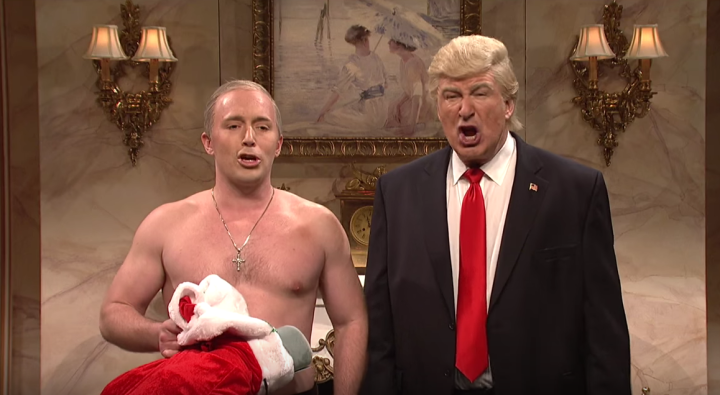 Meanwhile SNL is funny. It's vital to laugh, but it's even more vital to keep our eyes open and to stand for the best values of this country.